[Stride]-Stride Step-[Choose one or more cards with the sum of their grades being 3 or greater from your hand, and discard them] Stride this card on your (VC) from face down. [ACT](VC)[1/Turn]:[Counter Blast (1) & Soul Blast (1) & Choose a face down card from your G zone with the same card name as this unit, and turn it face up] Draw two cards. 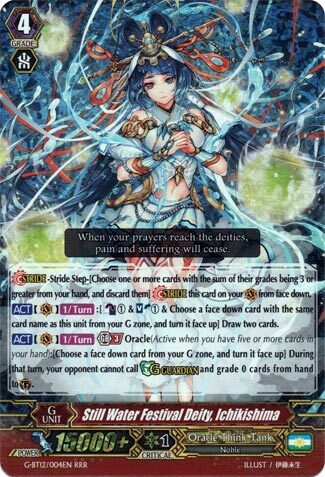 [ACT](VC)[1/Turn] Generation Break 3 Oracle (This ability is active when you have five or more cards in your hand):[Choose a face down card from your G zone, and turn it face up] During that turn, your opponent cannot call G guardian and grade 0 cards from hand to (GC). A proper finisher for OTT appears! Ichikishima here has everything attacking act as Silent Tom, with G Guardian sealing added in on top. Which of course basically means she’s good for Late Game, and basically no other time. That’s obviously bad as she’s not a brilliant catch-up tool, but there are other Mid Game options to try before then, especially in Battle Sisters with Stollen, or Susanoo with…any Kamusuanoo really. Best way to use this is with high critical Trigger count and go ham. This card’s first skill lets you commit a board reasonably guilt-free as it is, rear-guard support aside. Pay attention with this though, as Perfect Guards are still the go-to card to throw into this card’s face. Watch those Drive Checks.